The Arak reactor core has been removed, according to informed sources, and its place filled with concrete. Earlier, a spokesman for Iran's Atomic Agency said all of Iran's commitments under the Joint Comprehensive Plan of Action had been met, other than minor issues regarding the Arak Nuclear Plant. 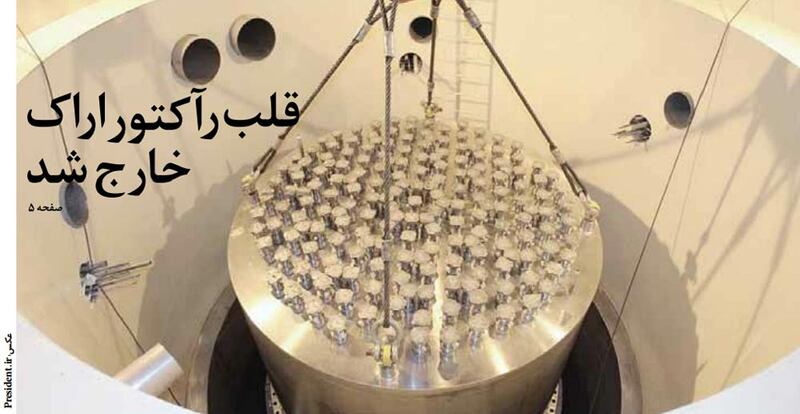 According to the agreement between Iran and the 5+1, the Arak Nuclear Plant will be redesigned. Once the International Atomic Energy Agency (IAEA), the UN nuclear watchdog, confirms Iran's full commitment to its nuclear concessions, the agreement will take effect. Deputy foreign minister Majid Takhtravanchi said on Monday that he expects the redesign of the Arak nuclear plant will start soon. President Rohani, speaking at the launch ceremony for the next phase of the Southern Pars oil and gas project, said he will soon have good news about the elimination of international sanctions.